In July 1994, pieces of the comet Shoemaker-Levy 9 slammed into thes outhern hemisphere of the planet Jupiter at a speed of 37 miles (60 kilometers) per second. Professional and amateur astronomers around the world witnessed the spectacular and historic event. This marked the first time that scientists had an opportunity to witness the collision of two extraterrestrial bodies (those existing in space beyond Earth's atmosphere). Pictures taken of the impacts appeared on the Internet within hours of the event, captivating the public. Afterward, while scientists studied data about the event, many in the public wondered if such a collision could happen to Earth and what would be the consequences. Science soon gave way to science fiction. By the end of the decade, popular movies like Armageddon (1998) and Deep Impact (1998) presented visions of Earth caught in the path of life-threatening asteroids and comets. Although movies about planetary disasters often seem far-fetched, impacts between extraterrestrial bodies and Earth are not. In fact, an estimated 100 to 200 tons (91 to 181 metric tons) of extraterrestrial material bombards Earth's surface every day. Much of this material ranges in size from dust to pebbles and lands unnoticed. During the planet's history, though, thousands of impacts have produced craters, some of which have measured 100 miles (160 kilometers) or more in diameter. These landforms exist everywhere in our solar system except on the gaseous planets Jupiter, Saturn, Uranus, and Neptune. Greek word meteoron , which means "phenomenon in the sky." The vast majority of meteoroids are fragments of asteroids, which are small, irregularly shaped rocky bodies that orbit the Sun. Asteroids are planetesimals (pronounced plan-ne-TESS-i-mals) or minor planets. They are ancient chunks of matter that originated with the formation of our solar system, but never came together to form a planet. The remainder of meteoroids are fragments of comets. Sometimes called "dirty snowballs," comets are clumps of rocky material, dust, frozen methane, ammonia, and water. A comet's tail, which forms as the comet approaches the Sun, is made of vaporized ice. Solar winds sweep the tail back away from the Sun. Once a meteoroid enters Earth's atmosphere, it becomes heated due to friction and begins to glow. The glowing fragments are known as a meteor, which is more commonly known as a shooting star. A meteor that is extremely bright is called a fireball. Large swarms of meteors entering Earth's atmosphere from approximately the same direction at certain times during the year are called meteor showers. On Earth, a meteorite crater, also known as an impact crater, forms when a meteorite greater than 3 feet (0.9 meter) in diameter hits the surface. The size and depth of the crater depend upon the size and incoming speed of the meteorite. 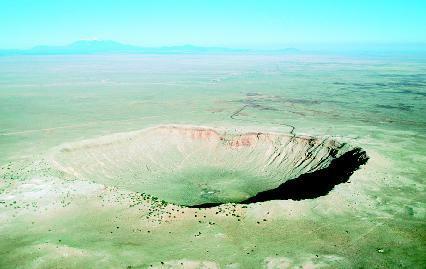 In general, a meteorite that hits Earth's surface creates a crater twelve to twenty times its size. When a meteorite slams into Earth, it forms one of two types of craters: simple or complex. A relatively small meteorite forms a simple impact crater. Measuring typically less than 3 miles (5 kilometers) in diameter, this type of impact crater is relatively smooth, bowl-shaped, and nearly circular. The rim or upper edge of the crater is well-defined and raised above the surrounding landscape. The interior of the crater is steepest near the rim. The slope gradually decreases toward the center of the crater. Partially lining the interior of the crater is a layer of breccia (pronounced BREH-chee-ah; a coarse-grained rock composed of angular, broken rock fragments held together by a mineral cement). The energy of the impact typically causes some rocks to melt. In simple craters, this impact melt is often found as small blobs of material within the breccia layer. Surrounding the rim of the crater is a circular layer of rock and dust thrown out of the crater during its formation. Known as an ejecta blanket, this layer is deepest close to the rim. It becomes increasingly shallow outward from the crater. A small, irregularly shaped rocky body that orbits the Sun. A coarse-grained rock composed of angular, broken rock fragments held together by a mineral cement. An icy extraterrestrial object that glows when it approaches the Sun, producing a long, wispy tail that points away from the Sun. The circular layer of rock and dust lying immediately around a meteorite crater. A glowing fragment of extraterrestrial material passing through Earth's atmosphere. A fragment of extraterrestrial material that strikes the surface of Earth. A small solid body floating in space. A wave of increased temperature and pressure formed by the sudden compression of the medium through which the wave moves. sheets of impact melt. An ejecta blanket surrounds a complex impact crater much as it does a simple impact crater. 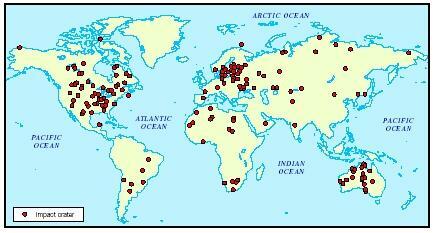 There are presently more than 160 known meteorite craters on the surface of Earth. Almost all have been recognized since 1950. New ones are discovered each year. The vast majority of recognized craters are found in North America, Europe, and Australia, where most exploration has taken place. Throughout the planet's history, countless other craters have existed. Like all other inner bodies in our solar system, Earth has been heavily impacted by meteorites. In fact, the planet has been impacted even more heavily than the Moon. Yet most of these impact craters are no longer present. The geologic processes responsible for mountain building, volcanic eruptions, earthquakes, seafloor spreading, and many other physical features on the planet's surface have erased their mark. Chiefly, they have been worn away by erosion, the gradual wearing away of Earth surfaces through the action of wind and water. The craters present on Earth today are either relatively recent, were caused by a relatively large meteorite, or are in a part of the world that experiences little geologic change (such as Antarctica or the Australian desert). Scientists have never observed the formation of an impact crater in nature. They have, however, figured out the mechanics of such an event through laboratory experiments. Scientists know that an average meteoroid enters Earth's atmosphere at a velocity, or speed, between 6.2 and 43.5 miles (10 and 70 kilometers) per second. Because of friction caused by the atmosphere, all but the largest meteoroids quickly lose velocity. Most simply burn up and disintegrate before reaching Earth's surface. When a large meteorite strikes the planet's surface, enormous amounts of energy are released. Many of the characteristics of an impact crater are the result of the energy released almost instantaneously during the impact. This energy can be compared to that produced by geologic processes on Earth such as volcanic eruptions and earthquakes. The sequence of events that occurs when a meteorite strikes Earth can be divided into three stages: contact and compression, excavation, and modification. A NEO or Near-Earth Object is an extraterrestrial body (an asteroid or a comet) whose orbit brings it within 28 million miles (45 million kilometers) of Earth's orbit. Those NEOs with orbits that actually intersect Earth's orbit are called ECOs or Earth-Crossing Objects. Scientists watch NEOs to determine which, if any, might one day strike Earth. Any NEOs smaller than 164 feet (50 meters) in diameter would disintegrate in Earth's atmosphere. Scientists believe there are perhaps 1 million NEOs larger than this size. Although the vast majority of these measure less than 0.6 mile (1 kilometer) in diameter, they could pass through the atmosphere and cause tremendous damage if they hit the planet's surface. The largest NEOs yet discovered measure less than 15.5 miles (25 kilometers) in diameter. If one of these NEOs struck Earth, the result would be disastrous. None of the known NEOs is currently a threat, but scientists have no way to predict the next impact from an unknown extraterrestrial object. Map highlighting the known meteorite craters around the world . than twice its diameter, its energy is transferred as shock waves to the rocks in the crater. (Shock waves are waves of increased temperature and pressure formed by the sudden compression of the medium through which the waves move.) Shock waves also form in the meteorite, beginning at the edge that struck the ground and moving backward. The shock waves compress the rocks in Earth's surface and the material in the meteorite. The extremely high temperature and pressure created at the area of contact melts or even vaporizes much of the rock and meteorite material in that area. As the shock waves continue to move through Earth's surface, both downward and outward, they lose speed and pressure. Rocks no longer melt, but become cracked and fractured. Rock that had been compressed in the center of the crater may rebound, forming a peak. At almost the same time, some of the shock-wave energy forces a stream of rock and dust (the ejecta) to be thrown away from the point of impact at high speeds and in all directions. The crater takes on its characteristic bowl shape with an uplifted rim because rocks near the upper levels of the crater move upward and outward while rocks in the lower levels move downward and outward. When the ejecta settles back to the ground, it forms the ejecta blanket around the crater rim. Finally, after the shock waves have diminished to the point where they no longer have an effect and no more material is thrown from the crater, gravity takes over. Weak rocks in the walls of the crater may fall or slide down, and portions of the ejecta may also fall back into the crater. The crater-forming process is very rapid. The entire sequence takes anywhere from a few seconds to one minute or so. 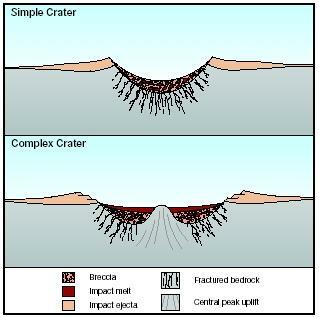 In relation to other geologic processes on Earth, impact cratering releases the greatest amount of energy in the shortest amount of time. Despite the tremendous forces that generate meteorite craters on Earth, those craters are not permanent. Like all other landforms on the planet, they are subject to erosion and Earth's ever-shifting surface. Water and wind quickly erode crater rims and ejecta blankets. They may also fill the crater with sediments and other rock debris, forever changing its form. Scientists believe that approximately 65 million years ago, a meteorite measuring about 6.2 miles (10 kilometers) in diameter slammed into a prehistoric ocean near present-day Mexico's Yucatan Peninsula. The buried crater is presently known as Chicxulub (pronounced cheek-soo-LOOB; from the Mayan word roughly meaning "tail of the devil"). Initially, the crater measured nearly 62 miles (100 kilometers) in diameter and 9 miles (14 kilometers) in depth. The energy released by the impact was 6 million times more powerful than that released during the 1980 eruption of Mount St. Helens in Washington state. The walls of the complex impact crater were unstable and soon collapsed inward. The final diameter of the crater was enlarged to between 90 and 112 miles (145 and 180 kilometers). During the crater's formation, clouds of water vapor and debris were thrown into the sky. Some of the 100 billion tons (91 billion metric tons) of vaporized material solidified into glassy spheres and rained back down on Earth. The rest of the material rose into the atmosphere where winds carried it around the planet. The material blocked sunlight from reaching Earth's surface, reducing temperatures worldwide. Inspired by a meteor shower? As the meteorite passed through Earth's atmosphere, the air friction generated searing heat, which ignited widespread wildfires. In turn, these fires produced tremendous amounts of soot, carbon dioxide, and sulfur dioxide. The sulfur dioxide reacted with moisture in the blackened air to form sulfuric acid, which fell to Earth in the form of acid rain. The lack of sunlight, combined with the air pollution and acid rain, soon killed off most of the plants on the planet. This led to the starvation of many animals, both plant-eating and meat-eating. Included were the dinosaurs. It is estimated that 70 percent of all plant and animal life perished within a few months of the meteorite's impact. Supporting the theory that this meteorite caused worldwide destruction is a layer of iridium found in Earth's crust at a depth marking that time period. Iridium is an element commonly found in meteorites, but is exceedingly rare in the planet's crust. Iridium, at thirty times the normal amount, has been found at this depth around the world, from New Zealand to Italy. Soot has also been found with the iridium, providing evidence of widespread forest fires. Located in the desert near Winslow, Arizona, is Meteor Crater, the first impact crater to be so recognized. The arid (dry) conditions in the area have helped preserve this classic simple impact crater. Measuring 0.8 mile (1.3 kilometers) in diameter and 570 feet (174 meters) in depth, the crater was formed roughly 50,000 years ago by a meteorite measuring 100 feet (30.5 meters) in diameter and weighing 60,000 pounds (27,240 kilograms). The rim of the crater rises 150 feet (46 meters) above the level of the surrounding desert plain. Scientists estimate that the meteorite, a solid mixture of nickel and iron, was traveling at almost 45,000 miles (72,405 kilometers) per hour when it hit Earth's surface. Some 4 billion years ago, roughly the same time life was forming on the planet, a flurry of asteroids rained down on Earth and the Moon. Scientists estimate that the barrage lasted from 20 million to 200 million years. It melted rocks, blasted out craters, and reshaped the surface of both Earth and the Moon. On the Moon, the bombardment produced the great basins that are clearly visible from Earth. On Earth, the huge asteroids produced craters rim-to-rim the size of present-day continents, vaporized the oceans, and filled the atmosphere with life-choking fog. Some scientists believe the impacts may have even affected the evolution of life on the planet. The asteroids may have forced life to begin anew or may have brought minerals, water, or even the building blocks of life to Earth. Meteor Crater is also known as Barringer Crater, after Daniel Moreau Barringer (1860–1929). A mining engineer, Barringer was the first to suggest the crater was the result of a meteorite impact. Before his assertion in 1905, many geologists believed it was a volcanic crater. Barringer spent many years trying to find the iron he believed would have been left over from the meteorite. He failed to realize, however, that most of the meteorite vaporized on impact. Nonetheless, his assertion behind the crater's formation was finally, and correctly, accepted by most scientists by the 1920s. The Vredefort Crater in South Africa is the world's oldest and largest recognized impact crater. Scientists believe the highly eroded complex crater formed just over 2 billion years ago when a meteorite measuring over 6.2 miles (10 kilometers) in diameter hit the area. Some 16.8 cubic miles (70 cubic kilometers) would have been vaporized in the impact. The crater, which is estimated to have measured approximately 90 by 200 miles (140 by 300 kilometers), was long thought to be of volcanic origin. It encompasses the entire extent of the present-day Witwatersrand Basin. Located within the center of the impact structure is a ring of hills called the Vredefort Dome. Measuring 43.5 miles (70 kilometers) in diameter, the ring is the eroded remains of a peak created by the rebound of rock below the impact site after the meteorite hit. Alvarez, Walter. T. rex and the Crater of Doom . Princeton, NJ: Princeton University Press, 1997. Gallant, Roy A. Meteorite Hunter: The Search for Siberian Meteorite Craters . New York: McGraw-Hill, 2002. Hodge, Paul. Meteorite Craters and Impact Structures of the Earth . Cambridge, England: Cambridge University Press, 1994. Mark, Kathleen. Meteorite Craters . Tucson: University of Arizona Press, 1987. Steele, Duncan. Target Earth . Pleasantville, NY: Readers Digest, 2000. Verschuur, Gerrit L. Impact! The Threat of Comets and Asteroids . Oxford, England: Oxford University Press, 1996. "Asteroid and Comet Impact Hazards." NASA Ames Research Center . http://impact.arc.nasa.gov/index.html (accessed on September 1, 2003). "Earth Impact Database." Planetary and Space Centre, University of New Brunswick . http://www.unb.ca/passc/ImpactDatabase/ (accessed on September 1, 2003). Impact Craters . http://www.meteorite.com/impact_craters.htm (accessed on September 1, 2003). Meteorite Central . http://www.meteoritecentral.com/ (accessed on September 1, 2003). "Meteors, Meteorites, and Impacts." Lunar and Planetary Laboratory, University of Arizona . http://seds.lpl.arizona.edu/nineplanets/nineplanets/meteorites.html (accessed on September 1, 2003). Hi, I was wondering if a Meteorite struck, let's say in a mountain area such as the now Granite Mountain range in Wyoming thousands of years ago, how would you know? Also, what would be the mineral compositon of the surrounding rocks is a meteorite struck near-by? How does speed of the impact object affect the size of a crater? I am writing an, Images of America book about the Barringer Meteor Crater (and its people) that, if on schedule, is due to be published in 2016. With that said, who can I contact regarding permissions and usage of some of the information contained in this article? A very nice article, indeed! how do you think will the mass of the meteoroid affect the formation of the meteorite crater?